In your daily practice it is tempting to worry about the next big thing. We think, “If I can just do a forearm balance I will be happy,” as if all would suddenly be right in the world when your feet lift in the air without smashing your face. The reality is that some asanas are always going to be difficult or painful, and if you do manage to find the perfect form it usually opens a door to dozens of new asanas that make you feel like a beginner all over again. I used to get frustrated when I saw someone come in for their first yoga class and do a better backbend that the one I had been working on for two years. I would spend half of the class with a ‘why me?’ mentality, obsessing about my tight shoulders which–as you can imagine–only makes shoulders and hips tighter! But I have since learned the beauty of yoga is that, while you will always see people who are naturally more flexible than you, you will never see someone with a well-rounded practice if they don’t practice a wide variety of asanas regularly. To me, a perfect revolved triangle is much more impressive than a handstand. Sure it won’t get as many likes on Facebook or Instagram but is that really relevant to your personal practice? Fancy yoga poses are just icing on the cake. They are the reward you get for being a practicing yogi. Notice how I refer to it as “practice.” If the asana was perfect on your first try, why would you need to practice it? You have to remember that in any given class I teach, only one or two people are working on handstand. The elements of strength are irrelevant if the student has not overcome issues with trust. Anyone can throw their feet into the air, but the fear of the unknown is a real issue many of us need to deal with before we can trust our bodies to bail us out. AND THAT FEAR IS OKAY. A good yoga teacher will stop you from throwing your legs in the air and encourage you to back off, focusing on fundamental asanas and bandha strength so you never throw your body around again! 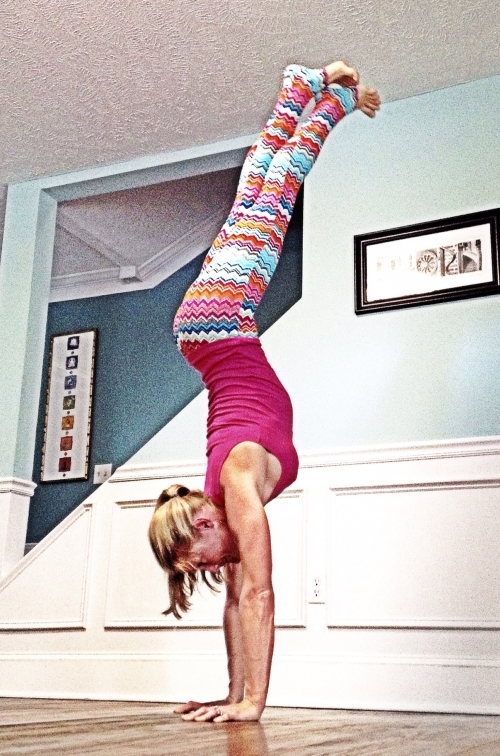 imageIt might have taken me two years to attempt a handstand by the wall, but my persistence and dedication to my daily practice has made me stronger and more versatile than many of the same people who are naturally more gifted than I. Doesn’t that seem true to many parts of life? It isn’t always the smartest or most talented people who succeed, it is those who persistently and consistently work hard at their craft. Treat your yoga practice the way you wish to be treated, with patience, kindness and trust. Practice continuously with the intent to heal your body if you want to find the greatest rewards yoga has to offer.